The Hand of Fatima is an ancient talisman that symbolizes feminine power. Originating from the Hebrew word hamesh, literally meaning five. 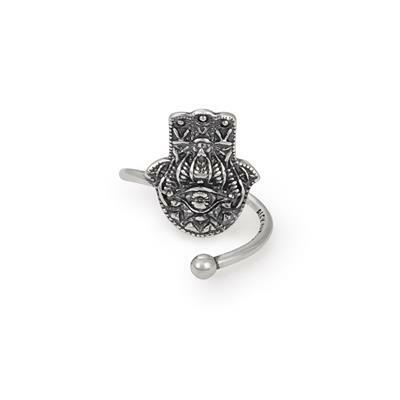 The hand is worn as a defence against negative energy, deflecting the gaze of the evil eye away from the wearer. Believed to channel the forces of good, the Hand of Fatima promotes healing and fosters miracles. Made from 925 Sterling Silver. This wrap ring adjusts to fit most fingers.